Elaine Hancock (Olney, United States) on 8 May 2012 in Plant & Nature. I wonder what flowers are?! Anyway, nice picture! Excellent frame Elaine. I love the exquisite treatment. Simplicity wins every time . . 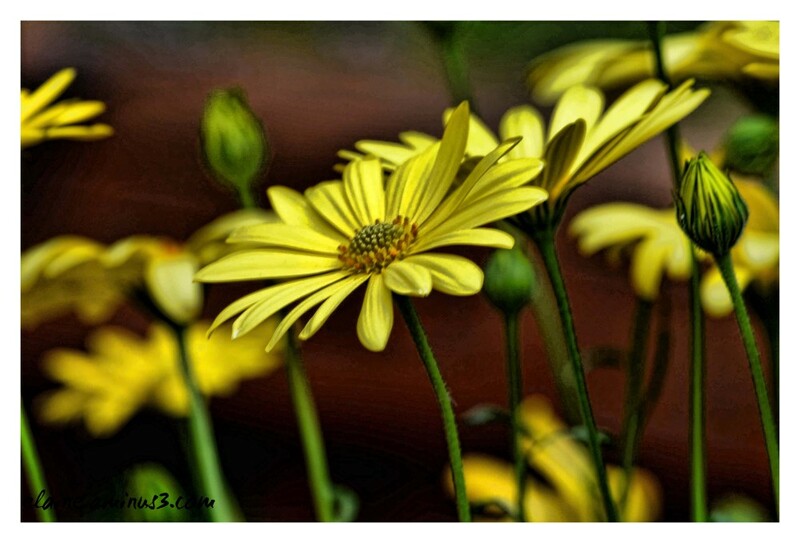 I can almost feel these gently sway . .
Love the processing, with the dark lines around some of the floral features. Good colors too. This is a delightful photo, giving such a feeling of peace and tranquillity. Excellent capture Elaine! Love your painterly style - excellent! sueprbe fleur très bien mise en évidence le fond fait parfaitemetn ressortir la couleur. I did a quiz one time titled "What kind of flower are you" and mine turned out to be the daisy.... and it is true. I love these flowers. A most pleasing presentation Elaine, fabulous color & detail. A delight! Those daisies are exquisite and I really love the way you've captured them Elaine. beautiful name "Daisy" !! :) joli !! Fabulous capture, great old fashioned mood ~ my grandmother's had these in their gardens! Oh wow! A great composition with such eye-catching colors that stand out beautifully! I love the details spotted in the lines of the daisies' petals! Stunning composition and edit! Love the colors! Almost like oil, the processing is very good. Fantastic tones and light in this one.